My husband and I were blessed to have Daisy come into our lives, she chose to live with us and love us and it was a fantastic journey. 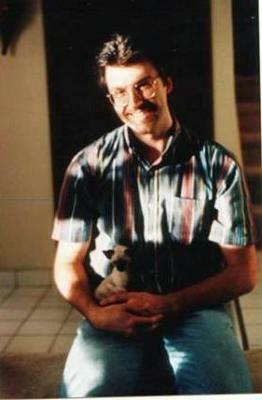 Fourteen years ago we visited a breeder just outside our home town to see a new litter of kittens. We got down to the floor to observe these new little babies up close, when this older, skinny, juvenile kitten crawled up my husband's arm and sat on his shoulder to see what all the fuss was. My husband gently placed this kitten back on the floor, but each time she ran back up his arm and shoulder, and refused to leave her lofty perch. This kitten had been held back, as the breeder said she had developed “happy coat” (a fever from her kitten shots) and wasn't sure if she was going to survive. Our attention was diverted from the newborn kittens to this funny, skinny little one, and we fell in love with her on the spot. That kitten was our Daisy. With the help of our vet, Daisy got strong and healthy and grew into a great beauty. Her beauty was as the vet put it, ‘cat deep’. She loved to be held, purred all the time and was so talkative. I have had other Siamese, but never one as talkative as Daisy. She loved to be chased around the house, usually ending with her diving into the rocking chair and rolling over to expose her tummy. Daisy also enjoyed the thrill of the hunt; if it wasn’t the bird watching out on the deck, it was stalking my husband around our kitchen island. Sun-worshipping was of course Daisy’s favorite pastime; she loved to lounge in the warm sunshine. When Daisy was about ten, she developed hyperthyroidism. The routine treatment is methimazole, but this thyroid-suppressing treatment made Daisy a tad zombie-like (her little spark was not so dazzling) so we opted for the radio-iodine treatment. The seven days of quarantine for Daisy was so hard on all three of us. When we were finally reunited, the staff at the clinic commented that they had never heard a cat howl and cry like Daisy did when she saw us; it was a joyful family reunion. In just a few months her health was back to normal, back to the chasing, hunting and sun-worshipping. In January of 2011 Daisy (then thirteen) started losing a bit of weight and blood work indicated CRF (chronic renal failure). Daisy’s weight loss continued and in July she was diagnosed with full blown lymphoma. We chose to let her live out her last days in as much kitty comfort as possible and we were lucky to be home with her to provide palliative care. I am so proud of Daisy, she was so strong; she died in our arms but not in our hearts. We miss this beautiful spirit, this shining star. She was the best cat in the world. I'm so sorry for your loss, Lucy, thank you for sharing Daisy's story with us. You were lucky to have her for most of her life - it's such a privilege to watch a boisterous kitten grow into a graceful cat and Daisy was a beautiful Seal Point Siamese. I can well understand her sun-worshipping tendencies - my cat loves to lounge in the sun too! I hope someday you'll feel like sharing your lives with another Siamese cat; he or she won't be Daisy, of course, but each Siamese cat is special in their own way and they're always so very individual! After the death of our beloved Daisy my husband and I were just numb. The house was empty, cold and extremely quiet. We attended a cat show in the fall of 2011 and found to our surprise that the Seal Point Siamese are not as popular at the shows any more. Most of the breeders in the show were focused on the Bengals (the new ‘in’ cat) and the beautiful Seal Point Siamese were missing. 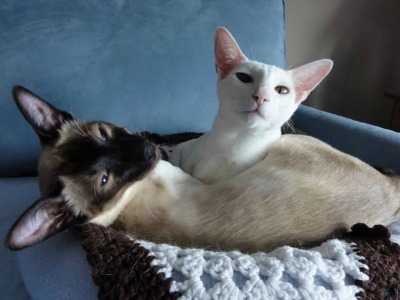 We did meet one lady who specialized in Orientals (with some Siamese mixed in) and asked to be contacted if she ever had a Siamese kitten from her one Seal Point Siamese Queen. Well on Dec.25, 2011 her Seal Point Siamese Queen had a litter of two white Orientals and one seal point Siamese, we knew it was a sign (a Christmas gift) from our beloved Daisy. The bleakness of winter was overturned with such Christmas joy; we would have another Siamese in our home in the spring. On April 1st, we brought home our new Siamese and her one white Oriental litter mate. In keeping with the flower name (like we did for Daisy) we named them Lily and Rose. The Siamese sounds are back in our home, both kittens love to talk and the house is full of galloping kittens playing and having fun. 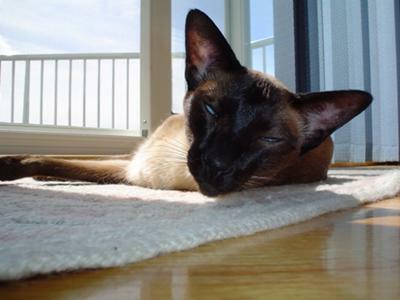 Lily the Siamese embodies sweetness; she is affectionate, adorable and constantly purrs. Rose the Oriental is brave and very outgoing but always calls out for Lily when she finds herself alone in a room or in their little bed. Our Daisy is their guardian angel and I thank her everyday for the heavenly gift she has sent us. p.s. Thank you all for your very kind words, it was a great comfort. Daisy was so special to so many who knew her. Lily and Rose, two happy sisters. Dax, who loved retrieving beads! I have a hole in my heart after our beautiful chocolate Siamese "Skittles" lost her battle with a tumour on her tongue just four weeks ago. We adopted her at two years old, and eighteen years later we have not been adults without her. She raised our three children to be gentle and kind and gave love every minute of her life. I hope we too will be brave enough to one day allow the joy of a Siamese to come back into our home and light up our lives once again. I had a beautiful seal point called Jasper who recently died. I feel empty and sad at his loss and will miss him dearly. He was intelligent and loyal and followed me everywhere. However, I will always remember him and know exactly how you must have felt when you lost Daisy. I'm so sorry. 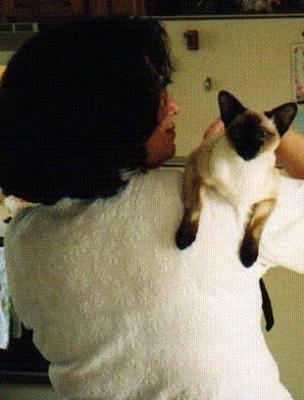 I know the pain losing one of those, my mother's own Siamese had to be put down in November 2005, her health was bad and it took us five years before we got another Siamese, we now have Sky. I have posted my own story about my kitty and how wonderful and special she was to our family. I am sorry for your loss. Aw - when I started reading your story, I had a feeling it wasn't going to be a happy ending. Though it was ultimately uplifting. Daisy sounded like an absolutely wonderful Siamese - not to mention beautiful. I had a Seal point that I lost more than 20 years ago, and he's still very much in my heart, as I'm sure Daisy will be in yours for years to come. Until we had Chuck, I didn't understand how much personality, depth, and love animals could bring to a home. We didn't have pets in our house when I was growing up, so I came to this realization later in life - the three of you are very blessed to have shared in one another for so long. Life is short, even for us humans, and even though I'm sure I don't fully understand what this means: "It is better to have loved and lost than never to have loved at all". I remember seeing your pain at work when we watched the video of Daisy while she was in hospital. I felt so bad for you and Dan. Especially this year when my husband and I lost our little doggie and best friend in May. But you were blessed with her in your life and probably became a much better person because of her. Our beloved pets do that for us. I hope one day you will get a sign from Daisy that it's time to get another little kitty in her honour. Thank goodness for blessed memories.